On the heels of last weekend's spate of postcards, here are a couple more to finish off the batch. File them under "The Way Things Were." LOBBY AT KONA INN ... Kailua-Kona, Island of Hawaii. 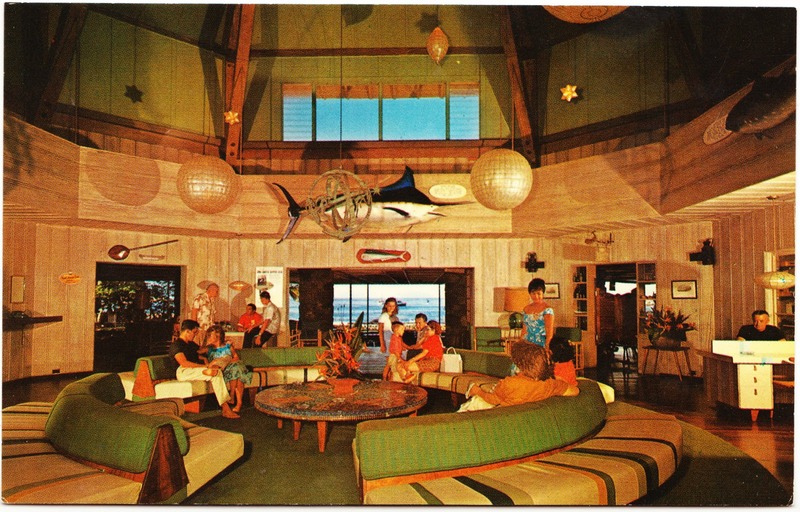 This unique setting, in charming island decor, greets arriving guests at the world famous Kona Inn. Published by Ray Helbig's Hawaiian Service, P.O. Box 2835, Honolulu 3, Hawaii. *Reg. 1951, Hawaii, U.S.A.
Nani Li'i Natural Color Card. Say "Nonnie Le'e" it's Hawaiian for "LITTLE BEAUTY"
The Kona Inn, which was built in 1928, is still around. 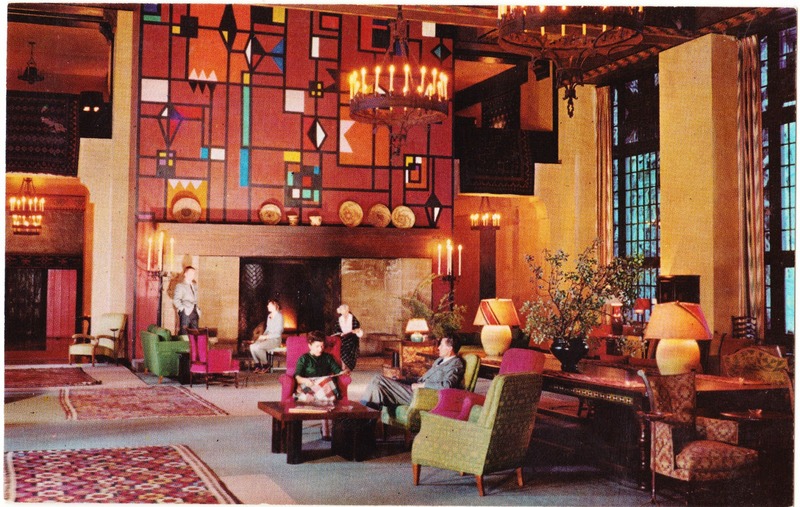 But its lobby is no longer nearly this groovy. The circular waiting area — which would be an amazing sunkenarium if it was lowered three or four feet — is long gone, which is a darn shame. I wonder if anyone kept the pieces. You can check out some photos of the lobby as it looks today on TripAdvisor. The Great Lounge of the Ahwahnee HotelThe Great Lounge is a magnificent room of gorgeous proportions. Its expanse is tempered by the use of warm colors, such as those in the highly effective mural above the fireplace, which repeats the cheerful tones of the furniture, the drapes and the floor coverings. The mural is, indeed, amazing, but it's gone now. It appears that the hanging lighting fixtures are still there, though. The Ahwahnee Hotel, built on the grounds of famed Yosemite National Park, opened in 1927 (one year before the Kona Inn!) as the centerpiece of efforts to facilitate and promote year-round tourism at the park. Its official architectural style is called, appropriately, National Park Service rustic, which is to say, in short, that it attempts to remain in harmony with its natural surroundings. It contains 5,000 tons of granite and 30,000 feet of timber. The Great Lounge contains two sandstone-cut fireplaces, one at each end. The Great Lounge and other elements of the hotel served as inspirations for the large studio sets in the UK that created the "Overlook Hotel" for The Shining. 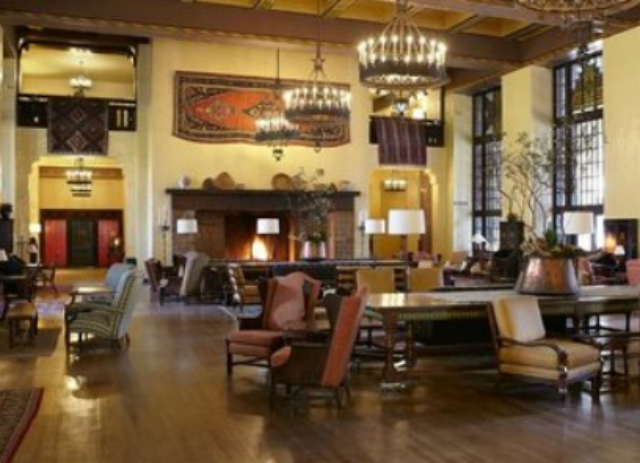 Following a series of mind-numbing wranglings and lawsuits over concessionaries, intellectual properties, trademarks and intangible assets, the Ahwahnee was renamed as the Majestic Yosemite Hotel in March 2016. Autumn, The Atlas and D.C.